If you do not have 'FW Ver 50,' were unable to locate the version you have, or need additional assistance, please contact customer service at 1-800-443-5542 or via email at info@paulcbuff.com. We are happy to assist you with making sure your equipment is up-to-date. *The repeater mode status that is present on the CSR+ or CSRB+ receiver is recorded and stored in the Cyber Commander in the OPEN MEMORY function. If the status is changed on the receiver, the Cyber Commander will revert the status as stored in the Cyber Commander. This status is also stored in the SAVE AS function, along with any other settings. While there is no direct user control of the repeater status in the Cyber Commander, Cyber Commander does recognize and can alter the status in the receiver. Please read all instructions before beginning this firmware update. 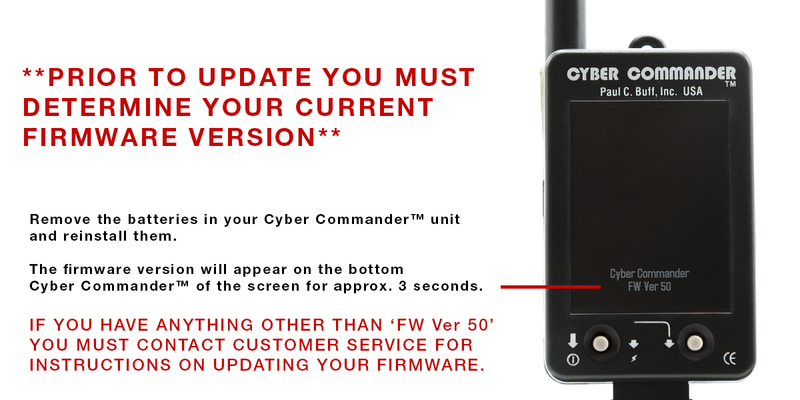 Even if you have updated the firmware on your Cyber Commander™ unit before, please review the instructions for this update as some steps have changed and there are special requirements that are specific to this update. Downgrading to a previous version of firmware is NOT possible after the version 50 update is performed. Click here to download the latest firmware update. Save the file “CC_V56.zip” to your hard drive, we recommend to the desktop. 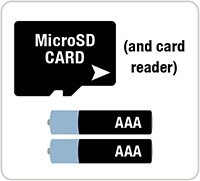 Insert the MicroSD card into the card reader that is connected to your computer. Navigate to the MicroSD card drive, click to open and confirm your MicroSD is empty. If any files or folders are present on the SD card, delete these files and folders prior to proceeding (backup if needed later). Leave this window open. Navigate to the “CC_V56.zip” file that you saved to your hard drive (desktop) and click to open, unzipping if necessary. In the window for the downloaded file, you will see a folder titled “PCBUFF” - click and drag this “PCBUFF” folder to the MicroSD card by dragging the file name/icon into the MicroSD card window. Note: Make sure the folder moved to the MicroSD card is named "PCBUFF". Eject or safely remove the MicroSD card from the card reader. Remove the batteries from the Cyber Commander™ remote. If there is a MicroSD card in your Cyber Commander™ remote, remove this card by pressing in, causing the card to pop out. Set this card aside for future use. 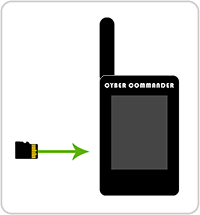 Take your MicroSD card with the downloaded firmware and insert it into the Cyber Commander™ remote. The MicroSD slot is located on the left side of the unit. Insert the MicroSD card into the slot, metal contacts first, facing up (toward the screen). Push until the card clicks into place. Install new batteriesi in the Cyber Commander™ remote. Your firmware update should now start. The Cyber Commander™ screen will go solid white and begin to flicker quickly, alternating between a fast and slow pace. The procedure should take approximately 25-30 seconds. When completed “Cyber Commander FW Ver 56” will appear at the bottom of the screen, and the unit will return to the “Flash” screen. With the update complete, remove the MicroSD card and reinstall the card that was previously in the remote (where you may have saved setups). All saved setups should be intact.ii If you wish to use the new card in place of the old card, you may do so, however, any saved setups will not be available on this card. You will either need to manually reenter the setups, or you can use our instructions to transfer the setups from one card to the next. If you opt to manually re-enter your setups, you may want to save an existing setup containing all lights and settings as “Internal1”. You can then use this as your master setup, avoiding having to open from studio and re-specify the lights. i It is very important that you use NEW batteries when you perform this update. If the batteries die during the update process, the process may fail and cause major problems with the unit, requiring you to send the unit in for service. ii If you have experienced lockup issues with your Cyber Commander™ remote in the past, continue using the new card that you used to update the firmware. If you had setups saved on the previous MicroSD card, you can either manually reenter the setups, or you can use our instructions to transfer the setups from one card to the next. The firmware 'Version 56' is our most up-to-date version. Optimization of battery life (decreasing power draw in sleep mode). Corrects the issue of incorrect model lamp wattage displayed when the model lamp is pushed past maximum power while attempting to track with flash output. This only occurred when the relative flash output was set lower than the relative model lamp power. Corrects pixels that remain after “Internal 2” is displayed in OPEN MEMORY or SAVE AS, as well as pixels that remain from the LOW BATT indicator. Corrects issues in which some MicroSD cards meeting specifications were not being read. Corrects an occasional error, sometimes found when the system is used with analog lights, where some indicators would not reflect that the model lamp was set to FULL. Corrects issues where the Cyber Commander™ may occasionally draw excessive power when asleep. NOTE: Downgrading to a previous version of firmware is NOT possible after the version 50 update is performed. The version 50 update includes all updates listed above, and returning to a previous version after the update is performed will NOT be possible.